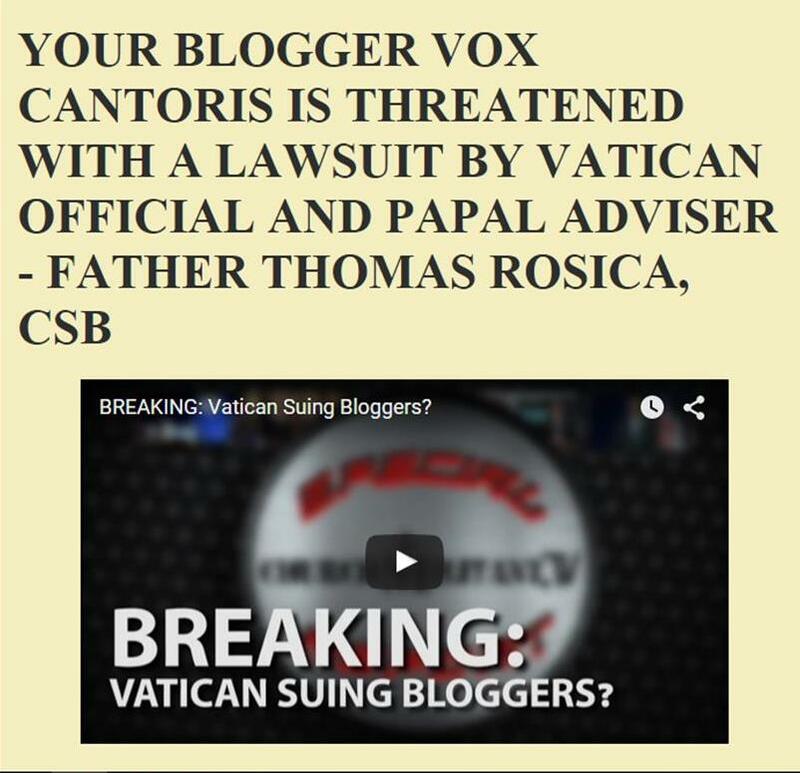 Vox Cantoris: Bergoglio confirms Amoris Laetitia allows for Eucharistic Sacrilege! Bergoglio confirms Amoris Laetitia allows for Eucharistic Sacrilege! The words of Jorge Berogoglio on the infamous chapter in Amoris Laetitia! Now we know. Now we know what Bergoglio really thinks, there is no more doubting it. Yet, there will be people, including in this combox, who will say, that he did not say this or that he said elsewhere, word that are perfectly orthodox. No. This is modernism and this is heresy. It only takes a drop of water to poison a litre of water. If you drink it, you will still die. 6) In other, more complex circumstances, and when it is not possible to obtain a declaration of nullity, the aforementioned option may not, in fact, be feasible. Nonetheless, it is equally possible to undertake a journey of discernment. If one arrives at the recognition that, in a particular case, there are limitations that diminish responsibility and culpability (cf. 301-302), particularly when a person judges that he would fall into a subsequent fault by damaging the children of the new union, Amoris Laetitia opens up the possibility of access to the sacraments of Reconciliation and the Eucharist (cf. notes 336 and 351). These in turn dispose the person to continue maturing and growing with the aid of grace. 9) It might be convenient that an eventual access to the sacraments be brought about in a reserved way, above all when conflictive situations are foreseen. But at the same time one must not cease to accompany the community, so that it might grow in a spirit of understanding and welcoming, without creating confusion regarding the teaching of the Church on the indissolubility of marriage. The community is an instrument of mercy that its “undeserved, unconditional, and free” (297). "Eventual access to the sacraments," for people who are in adulterous situations and who have no intention of rectifying it, or at least; as John Paul II taught, living as "brother and sister," if no other option were possible. "The document is very good and completely explains the meaning of chapter VIII of Amoris Laetitia. There are no other interpretations. And I am certain that it will do much good. May the Lord reward this effort of pastoral charity." There is no more doubt. Bergoglio is approving of sacrilege. He is licensing the "eating unto one's own condemnation." There is no more room for accusations that we are twisting his words or misinterpreting him or him being confused because something is not in his first language. He was quite clear in what he wrote, and what he meant. Any Catholic cardinal, bishop or priest who aligns himself with Bergoglio in this interpretation of Amoris Laetitia will bear eternal consequences for those faithful deceived by this lie - a lie from the very Bishop of Rome. Did you ever think that you would live to see the day? No more excuses. No, this is not dementia. This is not our mistake of what he said. He said it, and it is not Catholic. "acts which, in the Church's moral tradition, have been termed "intrinsically evil" [intrinsice malum]: they are such always and per se, in other words, on account of their very object, and quite apart from the ulterior intentions of the one acting and the circumstances. Consequently, without in the least denying the influence on morality exercised by circumstances and especially by intentions, the Church teaches that 'there exist acts which per se and in themselves, independently of circumstances, are always seriously wrong by reason of their object.'" " ... an attempt is made to legitimise so-called 'pastoral' solutions contrary to the teaching of the Magisterium ..."
The man must be denounced for his error and his heresy. Catholics have been betrayed by Joseph Ratzinger, a coward who abandoned us. A father who abandoned his children. The man that has taken his place is not a spiritual father, he is the equivalent of the evil stepfather who manipulates and abuses his children. No more excuses from any that Amoris Laetitia must be interpreted in the light of Tradition. No! Amoris Laetitia must be denounced along with the Pope who promulgated it. Enough of the excuses. You bishops and cardinals are cowards. You will be held account for not confronting this Bishop of Rome to his face! Nobody says it better than Father Hunwicke! So the 45 academics have their answer at last. They & those in the Hierarchy who are sympathetic to the SSPX must now act & call for an Imperfect Council. Silence is not an option & has thus far allowed PF & his cronies all the leverage they wanted to bring AL to fruition. They can now surely be dislodged as heretics & a new conclave held to appoint a true successor of St. Peter. If you can live in adultery and receive Communion, then is there a mortal sin which can keep you from Communion? The principal is established. And how is it not heresy for a pope to teach contrary to the universal tradition of the Church? Is there a Catholic bishop in the house? Where is the burning and righteous indignation from our bishops? A while ago I actually heard a priest who had the courage to correct one of Jorge's heretical statements. This took place at an SSPX chapel. Surprise? We are living through the collapse of the Church. But the good news is the hierarchy will "accompany" us to hell. If the Church fails to make a valid sacramental marriage in a vast majority of cases due to poor catechesis, (I would say of both the priest and participants) it's looking to me that the others are becoming suspect. It still amazes me that such a clear thinker as Benedict would support this garbage. I can't believe that he is afraid of death, or of being blackmailed because of concern for his reputation. The only explanation that seems to make sense is that the Church sees it's coffers diminishing and so is willing to conform itself to the world. Fred, I believe the mortal "sin" you are speaking about occurs when someone is critical of PF* agenda. "4) This journey does not end necessarily in the sacraments, but rather can be oriented to other ways of being better integrated into the life of the Church..." (cf.299). Just another heresy, amongst numerous, from the mouth of the Patriarch of the World! Only the willfully blind cannot see. Why are the vast majority of good Catholics seemingly incapable of recognizing the Truth before their noses? Why do so many, who are knowledgeable, stubbornly cling to the SSPX, who say in one breath that Bergoglio is an heretical non-Catholic dispensing poison to the soul and in the next, that he is the Vicar of Our Lord Jesus Christ? Modernist, yet Vicar of Christ! Excommunicated from the Church by heresy, yet Temporal, Sovereign Head of that same Church! Oxymoron of all oxymorons!!! The reason for these anomalies lies in the Inscrutable Ways of God. Our Lord gives a special grace of discernment to the few. It has always been so. Holy Scripture asks whether Our Lord will find Faith on the Earth, when He returns. The implication of this question is that only very few will have kept the Faith. Noah and his family were the faithful few saved from the deluge; so also Lot's family, the faithful remnant from five sodomite cities; St. Athanasius stood alone against the world with his little band of faithful Catholics against the Arian hierarchy; Saint John Fisher, the only faithful Bishop in England! Saint Robert Bellarmine confirmed the observation of the few: "It is granted to few to recognize the true Church amid the darkness of so many schisms and heresies, and to fewer still so to love the truth which they have seen as to fly to its embrace." Why does God do this? His ways are inscrutable! Who of us does not want to be counted among the few? We can be - if we stick to the pure, undiluted, undefiled Catholicism of the ages! We are told there are 1.3 billion nominal Catholics in the world. I recently read that there are an estimated 10,000 sedevacantists. If these figures and my maths are correct, there is 1 sedevacantist per 600,000 nominal Catholics. Once again the faithful remnant are few! 'Francis is senile', Francis is suffering from dementia', 'Francis doesn't know any better', 'Francis is being kept in the dark', 'Francis doesn't explain himself clearly enough', 'They are twisting his words', etc, etc, etc. Time for faithful people everywhere to face reality. The denial has to end. Francis is destroying the Church and it's his prime goal to do just that. No longer is he a 'confusion', or 'ambiguous'. He is clear about his APOSTACY. CRYSTAL CLEAR. And no, he's NOT just another 'Bad Pope' as so many others we've had that the Church has suffered through. Another excuse I see far too often. Time to face reality people.... Francis is a DESTROYER of the Church, and his destruction is calculated, has been planned and is now being executed. THE DENIAL IS GETTING OLD, AND HE IS OUT IN THE OPEN NOW. I pray that all will take off those 'Rose Colored Glasses' and SEE HIM for what he is. Rather than Pope, write Poop. Bergoglio teaches that they will be ANNIHILATED. He denies the existence of Hell - heresy most foul! 2. Question: "What happens to that lost soul? Will it be punished? And how?" The response of Francis is distinct and clear: "there is NO PUNISHMENT, but the annihilation of that soul. All the others will participate in the beatitude of living in the presence of the Father. The souls that are annihilated will not take part in that banquet; WITH THE DEATH OF THE BODY THEIR JOURNEY IS FINISHED." Bergoglio denies eternal punishment in hell - heresy most foul! Bergoglio denies two dogmas of the Catholic Church - he denies eternal punishment in hell. Do you dispute that statement? Therefore, per definition, he is a heretic. Do you dispute that statement? Therefore he is not a member of the Catholic Church. Do you dispute that Statement? Catholics are required to let heretics be anathema. Do you dispute that statement? Therefore nothing that Bergoglio does, or says, is of any relevance to Catholics. Do you dispute that statement? You have not disputed, or denied, any of those statements over a considerable time, which can only signal your approbation! How do we know these documents are authentic? I can imagine that pope Francis would say something like that, but it could also be someone who loves to make upheavel. Has there been an official publication by these bishops? I would like to have an official confirmation. That Pope Bergoglio is a privately a heretic, many Catholics can accept. That this latest statement is Magisterial teaching?...no it is not. Yes, we must fight the poison. But the Catholic Church cannot officially endorse mortal sin via her Ordinary Magisterium. If She did, you would have a defective Church leading souls to Hell, and there would no longer be any point to being Catholic. To "stay and fight" in the Church would be a fool's errand, as you would be fighting for a defective Church. And, sorry to Vox, but this has not happened yet, and this statement does not exactly condone mortal sin, nor is it Magisterial teaching. But boy, I have to say, this is kinda as far as it can go. But the line was not crossed. The Church has not proposed heresy to the world, even if Pope Francis is himself privately a heretic. For the record, LifeSiteNews has some additional details. "The blogger who published the documents writes that the priests of the diocese met Thursday to discuss the matter. At the meeting, some priests were openly critical of both the bishops’ directive and the Pope’s document. The blogger adds that Cardinal Mario Poli was present at the meeting with a canon lawyer and that both contradicted the bishops’ directive, "clarifying that the Eucharist can only be received by those divorced and remarried who live together as brother and sister, maintaining chastity." The leaked document is the first time there is explicit confirmation that Pope Francis interprets Amoris Laetitia as allowing communion for divorced and remarried Catholics without the condition that the couple in the irregular situation live as brother and sister without sexual relations, as was always required by the Church." How do we know the documents are authentic? Well, wouldn't the Vatican press office issue a swift denial if they weren't? The blogger adds that Cardinal Mario Poli was present at the meeting with a canon lawyer and that both contradicted the bishops’ directive, "clarifying that the Eucharist can only be received by those divorced and remarried who live together as brother and sister, maintaining chastity." Francis is using this to FORCE faithful Catholics to accept as the only alternative the Anglican's approach of every diocese/region deciding things for themselves. So as horrifying as it is that the Pope is promoting profaning the Blessed Sacrament, he is also working towards other wretched goals. If the faithful Bishops and Cardinals don't denounce this as heresy and confront him, they never will, and I'll have some thinking to do, as I'm sure many will. Jesus, your lambs are being scattered! Have you seen Fr. Z's take on this? Isn't father missing the point though? Amoris Laetitia is magisterial, and the Pope Francis says that the official interpretation of Amoris Laetitia allows for sacrilegious communion, therefore, hypothetically speaking, sacrilegious communion has been made lawful by an act of the magisterium. Is this correct? Is this where the line between "private heresy" and "public heresy" has been definitely crossed? No, "other ways of being better integrated into the life of the Church [than they are currently related to the Church]"
DEAD members of the Church cannot be integrated into the LIFE of the Church until they are restored to life through the Sacraments. Giving them things to do to keep them busy and make them feel better is a false integration since it doesn't get at the root issue. The Church exists to save souls, not to give people busy work. The stress on technicalities, while the great humble uniter/decider pushes "forward" unhindered, is undeniably Pharisaic. The fruit of his call to change everything and make mess - in accordance with the spirit of his god of surprises - are indoctrination with depravity and religious indifferentism of small children attending Catholic schools, and islamization of the Christian world (it is not possible that the Jesuit is not aware of the goal of Islam - sharia law for all), among other things. The fruit of his works are not sinners repenting, and unbelievers coming to Christ. He doesn’t want anyone to convert anyway. He advises against it. As many highly intelligent Catholic commenters here know, very few Catholics today are able to teach their children the true Catholic faith. The indoctrination in schools and the policy of enforced religious indiffrentism (stating that the fullness of truth is in the Church only should soon be a crime) are facts Bergoglio is not only aware of, they are facts he works hard on bringing about. These facts mean that soon there will be no one left who will know the faith and who will be able to practice it. They got control of the children, of the future. He is the driving force. Not only is he a heretic, he is openly the enemy of the Church. Look at one fact alone - as pope he swears to uphold the Tradition of the Church unchanged, and yet he wants to change everything, to keep pace with the world inherently at odds with the Kingdom of Heaven. Why all this talk, when we clearly see his spirit. It is obviously the spirit of an anti-Christ. Our Lord never lied, never deceived! Deception is Satan's domain. Bergoglio wears many masks. He is manipulative and inconsistent. In his homilies he is blatantly pushing the agenda of so called social justice and false mercy. He is deliberately distorting the Scriptures. In this context, do these technicalities really matter? Should I believe that my Lord God expects me to understand them, or that He expects me to obey Jorge Maria Bergoglio? Dear Anonymous @ 4:36pm, St.Columba, Me no expert, but I think you are correct regarding this letter not being magisterial. It was a private communication, not directed to the universal Church. However, AL ticks all the boxes for being magisterial. If we forget about all the others and single out only the heresy regarding hell in AL 297 quoted above, that single heresy is sufficient to blow the whole house of cards down. i. It makes Bergoglio a formal, manifest, pertinacious heretic. ii. It captures him teaching false doctrine as Pope, on Faith and Morals, to the Universal Church. This is the ultimate PROOF that he CANNOT be a true, formal Pope!!! A true Pope cannot teach heresy to the Church. "But the Catholic Church cannot officially endorse mortal sin via her Ordinary Magisterium. If She did, you would have a defective Church leading souls to Hell, and there would no longer be any point to being Catholic. To "stay and fight" in the Church would be a fool's errand, as you would be fighting for a defective Church." Nobody could have put it better. One can't mix oil with water. Christ cannot mix with belial. Christ's Church cannot be mixed in belial's church. A Catholic cannot "stay and fight" in belial's church. A Catholic must get away from belial's church and fight against it in the Catholic Church. Where is the Catholic Church today? It is in you and me and all those who remain faithful to the pure Catholic Faith of the ages. Saint Athanasius, pray for us! Simply diabolic. It is the great horror of our time that no bishop has issued a formal warning regarding all or any of his many continually-asserted heresies, his general false philosophy and theology, his Modernism, which is incompatible with and antithetical to Catholicism, and amounts to a synthesis of all heresies, leaving nothing of the true Faith and morals intact. The Syllabus of Errors reads like a description of Francis's false and diabolic religion. Are there no bishops that care enough about God and His crucified Church, souls oriented to Hell, that would give public warnings for retraction and condemnation of his heresies and on his refusal, tell the world that he is what he clearly is, a heretic and not a Catholic, and that he has lost the Office of Peter. The Magisterium has no power or authority to purport to contravene the fixed Deposit of Faith. This is flagrant error. The Magisterium can only uphold and defend the unchangeable Deposit of Faith. Yes, it is absurd to contend that he doesn't understand and thus doesn't intend his continual and public heresies, blasphemies, sacrileges, etc. which he has been very persistent, nay obstinate, about, since the moment of his election. Yes, the tortuous excuses of the few apparent good Bishops to avoid outright condemnation of continually-asserted heresies, etc. is the most painful and incredible thing. I expected Bishop Schneider to issue formal warnings and calls for retraction, years ago. The bishops ought to act. They ought to have acted years ago before the heresies reached to such a mountain, burying all of the true Faith. Our Lady of Fatima, intercede for us sinners. and the sun of the ancient religion sets thanks to an antiplatonic peronist megalomaniac who wants his name in history, and it sets only to whispers. cowardice of this age is sickening. where is our mark of ephesus? and if our religion is divine, where is God in all of this? the promise of the gates of hell not prevailing? well the forces of hell arent having much luck against the border fences of hungary, bulgaria and macedonia. fences our man bergoglio opposes. We gave our pastor a letter this morning. It states that Pope Francis has made himself a heretic, committed blasphemy, and we expect our Bishops to label what he has pronounced a heresy and denounce his actions. It is sad to have to state such a thing, especially to our priest who must have mentioned Pope Francis at least 10 times during his homily. How can such a good and faithful priest have allegiance to such a terrible pope? This is something we don't really understand. Thanks for the Post! :-) I noticed you writing at another blog, and I liked reading your posts! Ya, so Amoris Laetitia....for me, there is no clear endorsement of mortal sin anywhere in the document. I know many people who disagree with me on that, but then again, there are many who agree. If AL clearly promotes mortal sin, I would most likely leave the Catholic Church, because the Church's indefectibility extends to her disciplines being infallibly safe, which they would clearly not be in this case. AL sure makes it look like the Church is endorsing sac. communion, but I cannot see where it clearly does such a thing. But this is exactly what I would expect if someone working for the enemy ever became Pope. The devil, and his agents, work is the area of suggestions, illusions, plottings, etc....not clarity and simplicity. Fr. Z sadly is known to be like Lombardi when he needs to. He's been severely wrong on the Francis pontificate since day 1, and his attempt to spin this is vain damage control that will be ineffective. I'd become wary of him since he continued to slander Fr. Gruener falsely and avoid correction, as well as refusing to discuss the homosexual priest scandal on Michael Voris' Mic'ed Up show. I frankly don't know what his deal is, I wouldn't classify him among those who make routine excuses for Francis with their heads in the sand, but there are some places Fr. Z is unwilling to go if the implications are too high. Dear St. Columba, You didn't ramble - you just keep hitting the nail on its head. "Imagine Satan himself becoming the Pope, and he has to wrestle with the fact that Christ's Church could not defect. What would that look like? I imagine something very similar to the situation we are in: the devil would make it *appear* that the Church endorses this or that, but all the while, the promises of Christ are never made void as there is no official, Magisterial promotion of objectively grave sin, etc..."
Absolutely! The devil is the ape of Christ and his church, the ape of the Catholic Church. That's a jolly good description of exactly what's going on. lucifer hasn't become pope, but his right hand man has - quite literally. I can't comment on AL as a whole, or on the debate surrounding it, because to me it's the babblings of a heretic, not worth the paper it's written on and is only good for emergencies on a camping trip. However, the devil always shows his tail. That heresy in 297 of AL is his tail. It's short, sweet and to the point. It is an indisputable and unambiguous contradiction of a dogma and as I said, all by itself enough to crash AL and Bergoglio. Heresy is a mortal sin and right there you have the one you are looking for. That's a clear endorsement of mortal sin in AL - the denial of eternal punishment in hell. "The devil, and his agents, work is the area of suggestions, illusions, plottings, etc....not clarity and simplicity." No, Pope Francis is not "approving" of sacrilege, nor "licensing" it. He himself originated the Amoris Laetitia offensive by abusively stage-managing two otherwise unnecessary Synods. So let's stop making excuses for him, shall we? This isn't something Jorge Bergoglio is going along with, but something he has done. He isn't Cardinal Kasper's puppet; Cardinal Kasper--God help him and God help us all--is his. Given the context of AL297 (no one should be condemned forever, not the logic of the gospel) he is not, seemingly, talking about God's judgement, eternal life, etc....but rather how the Church and us humans approach folks who are living in sin. But it was a very bad choice of words. However, even if my interpretation above is wrong, the Pope is not, in that sentence, "promulgating a definitive teaching related to that topic, namely salvation". Am I on think ice? Yes, a bit. But the alternative, for me, is to conclude that Catholicism is false, and I need more evidence to convince me of that than wayward quotes from a Pope. I need clear, unambiguous heresy formally taught, as such, from his Magisterium. I have given sedevacantism a very fair hearing, studying it for about 2 years. I would likely choose sedevacantism over the recognize and resist solution (SSPX), which seems really stupid to me. But, ultimately I have rejected sedevacantism as well, perhaps due mostly to the writing of Quaremerepulisti over at SuscipeDomine. But for some reason I really like sedevacantists as people, and I totally get their position. Dear St. Columba, I think I have found a pal! I think you are as sharp as a razor. He said "can be" rather than "should be", which makes a difference. If you analyse just 297, in detail, it is bulging with crap, but it would take a booklet to write it all out. He is slippery as the devil, because the devil himself guides him. How I wish we could chat over a braai, with beer in hand. I don't know Quaremerepulisti, or SuscipeDomine, but I'm gonna check them out. You can't leave the Catholic Church, because there is nowhere else to go. You know that as well as I do. The annihilation one is pretty unambiguous, but you might argue that's it's not magisterial since it emanates from a newspaper interview and not a magisterial document. I would counter that by remembering that he has stated that his homilies, encyclicals etc. are to be considered as magisterial. He knows full well, that in this electronic age what he says to any reporter, will be flashed around the entire world in a matter of hours. I don't think he will ever give you what you are looking for. If it was too obvious and blatant and bald-faced, eg. a formal, magisterial denial of the Immaculate Conception, the whole Catholic world would revolt in an instant. Maybe one should take an overview right from the beginning. Are you familiar with Fr. Villa's expose of Paul the Sick? One's legs feel very shaky when one has that Damascus moment. I read flat out for 18 months before I started feeling confident and secure in sedevacantism. I took great confidence along that road from St. Louis Marie de Montfort, who said "a man who says the Rosary every day WILL NOT be misguided", and from that day I make jolly sure I say the Rosary every day, come hell, or high water. I always pray to the Holy Ghost: "Pleeeease don't let me be misguided!" I only blog at Vox now, who has really made me feel at home. All the others kicked me out, so you will always find me here. Please keep in touch and drop a comment now and then. Let us know how things are going. I live near the Toronto area. This papal letter only adds more weight to what we already know! Back in 2014 C Jorge as *Pope* phoned a woman in Argentina “living in sin” with a divorced man Jacqui Lisbona, told her that she was doing nothing wrong and can receive Holy Communion adding “There are some priests who are more papist than the Pope.” C Jorge never denied it, the only rather pathetic statement came from the Vatican spokesman Father Federico Lombardi, confirming that the phone call did take place, but indicating that reports about what was said may not be reliable..
We will never get an answer as to the authenticity of this papal letter but you can be assured now that it’s out C Jorge will do his usual trick of trying to offset the evidence by using the media for a little sound bite that makes him sound Catholic.. Yes that normally does the trick! So vox lets throw this under the carpet where the rest of C Jorge heresies are kept. Peter said..."How do we know these documents are authentic? I can imagine that pope Francis would say something like that, but it could also be someone who loves to make upheavel. Has there been an official publication by these bishops? I would like to have an official confirmation." Peter, I am unable to imagination that "Pope Francis would say something like that." VATICAN (ChurchMilitant.com) - Regarding divorced and remarried couples, Pope Francis clarifies, "Integrating into the life of the Church doesn't mean receiving Communion." He adds that to do so "would be an injury also to marriage, to the couple, because it wouldn't allow them to proceed on this path of integration." In regard to Catholics who "after an irreversible failure of their matrimonial bond, have entered into a new union." Father John Zuhlsdorf has an updated post on the issue at hand. He is 100 percent correct. His Holiness Pope Francis has not changed Church teaching on the issue in question. Father Zuhlsdorf's commentaries the past couple of days on the purported letter from Pope Francis have been serene and outstanding. Please dear brothers and sisters in Jesus Christ, let us follow Father Zuhlsdorf's sound Catholic lead in regard to the purported letter and situation in question. Do not worry. Do not fear. His Holiness is orthodox, as the True Church testifies each time She offers Her Sacred Mysteries, during which She commemorates Pope Francis as God's orthodox guardian of the True Church. We also have Our Lord and Savior Jesus Christ: "Simon, Simon, behold Satan has demanded to sift all of you* like wheat, but I have prayed that your own faith may not fail; and once you have turned back, you must strengthen your brothers." Deo gratias, the Church of Rome maintains the True Faith. God is in control. Do not waver...do not fear. As God commands us, please remain attached to the Vicar of Christ, His Holiness Pope Francis. The Blessed Virgin Mary protects our brother, Pope Francis. Read the post coming up today at 16:30 EDT. Mark, eventually there comes a point where a naive but perhaps well-intentioned tendency to look for the best in others, including prelates, becomes a situation where you are deceiving not only yourself, but others, and thus rises to the point of committing sin by not recognizing evil as evil. That point has long been passed with regard to Pope Francis. If this glaring example of heresy doesn't convince you, nothing will. Thus there is no point in arguing against everyone else if you aren't willing to admit it. Cut it out with making excuses for this evil man. It's more than just those living in sin been allowed to receive the Blessed Sacrament,it's the abolition of the very concept of sin,priests were recently instructed to give absolution without any verbal confession been made ,one priest described this as sacrilege.The idea that it does not matter what religion you belong to is a direct violation of the First Commandment.The word Hell has been replaced in the Apostles Creed by "He descended to the dead".in one version of the Bible the Our Father as taught by Christ Himself has been changed.Nothing is Sacred to these people,they do not believe in the Real Presence. Vox said..."Read the post coming up today at 16:30 EDT." Vox, do you mean a post in this thread on the latest or a post in the following that you posted yesterday? "Vatican confirms it - Bergoglio said, "Non ci sono altre interpretazioni!" I don't "make excuses for this evil man." To begin, I embrace #2478 of the Catechism of the Catholic Church. 1. This "evil man" is commemorated as the true and orthodox Chief Shepherd of the Catholic Church via the celebration of Her Divine Liturgy. During Her Sacred Mysteries, God's holy priests, commemorate His Holiness Pope Francis as the Church's orthodox guardian of the True Faith. The Holy People of God unite during the Sacred Liturgy with God's holy priests as the Holy People of God exclaim "Amen" to the commemorations of Pope Francis. The sense of the Church/the sense of the Faithful does not fall into error. Jesus Christ, Our High Priest, prays for Pope Francis to prevent the failure of the Vicar of Christ's faith. That is a prayer of monumental power in favor of Pope Francis. The Blessed Virgin Mary protects Pope Francis. Saint Joseph protects the Church. Anonymous, everywhere we turn, we find that Pope Francis enjoys supernatural protection in regard to the fulfillment of his duties to God and Holy Mother Church. 2. That is why I'm calm and confident now, and should I remain alive one second from now, will remain calm and confident that the Vicar of Christ has not led us into error. I have every reason to believe that. I don't have a shred of doubt in that regard as God will not prevent His beloved Apostolic See from embracing and promoting heresy. 3. Therefore, even though the situation with Pope Francis may be difficult for some Catholics to understand/accept, Jesus Christ and the Blessed Virgin Mary call us to remain calm, attached to Pope Francis, and obedient to the Bishop of Rome. 4. Please, each of us as Catholics must recall Jesus Christ's teachings in Matthew, Chapter 18: Jesus expects us to "become as little children," to "humble" ourselves should we wish to enter into the Kingdom of God. As Catholics, let us embrace that stance during this time which, I realize, is not easy for many of us. Please, we must remain attached to Pope Francis, the Vicar of Christ. Even during the darkest moments today, we can be filled with serenity and supreme confidence as via our Sacred Mysteries, which do not contain error, that throughout the world and around the clock, God's Holy Church commemorates Pope Francis as Her orthodox guardian of the Faith. His Holiness Pope Francis may have said and/or done things that certain Catholics have found difficult to accept. But we can buoy ourselves as Catholics with the supreme knowledge that "in the Apostolic See, the Catholic religion has always been preserved immaculate." "3. Therefore even though the situation with Pope Francis may be difficult for some Catholics to understand/accept, Jesus and the Blessed Virgin Mary call us to remain calm, attached to Pope Francis, and obedient to the Bishop of Rome." Well, Mr. Thomas, you show above that you accept the progressive views of Pope Francis. Quite a few in the Church these days also want to see the teachings of the church change, as you do, regarding marriage and the reception of communion. Also, how do you know that Jesus and the BVM want us to remain calm and attached to Pope Francis? Are you a prophet, or perhaps a Charismatic? Mark, so if a future Pope officially declares Francis was in fact a heretic, and that people like you who said otherwise were wrong, will you then retract what you've said and apologize? What will you do then? While God may protect His Church from infallibly, dogmatically teaching error, this does not prevent individual Popes from being heretics, as has occurred before. Many sites and blogs by individuals far smarter than us have explained this at length. ~M. Ray said..."Also, how do you know that Jesus and the BVM want us to remain calm and attached to Pope Francis? Are you a prophet, or perhaps a Charismatic?" Did not Jesus Christ build His Church upon the Papacy? In turn, is it the Faith of the True Church that God calls us to attach ourselves to His Pope? The last time that I checked, the True Church proclaimed that Her Pope Is His Holiness Pope Francis. Jesus Christ declared the following: "He that heareth you, heareth me; and he that despiseth you, despiseth me; and he that despiseth me, despiseth him that sent me." The Blessed Virgin Mary expects us to obey Her Son, Jesus Christ. The Blessed Virgin Mary said of Our Lord and Savior: "Do whatever He tells you." That is how I know that we are called by God, and exhorted by the Blessed Virgin Mary, to remain attached to Pope Francis. At Traditional Latin Masses, we pray the Roman Canon. Each time the Roman Canon is offered, God's holy priest commemorates Francis as our Pope, and testifies that Pope Francis is the orthodox guardian of the Catholic and Apostolic Faith. The Faithful present unite to the priest and his commemoration of Pope Francis. The Faithful proclaim "Amen" in regard to the commemoration of Pope Francis as our orthodox Pope. That is how I know that God has called us to attach ourselves to Pope Francis. Anonymous, "many sites and blogs by individuals far smarter than us" can explain anything that they please at length. There are Protestants, Eastern Orthodox, Jews, Moslems, and atheists far more intelligent that I who insist that the Catholic Church is a fraud. I don't care what people, Catholic or non-Catholic, who are far more intelligent that I have to say about Popes and heresy. "..."in the Apostolic See, the Catholic religion has always been preserved immaculate." To this day, with His Holiness Pope Francis in charge of the Apostolic See, Holy Mother Church and Her Faithful hold fast to the Formula of Pope Saint Hormisdas. Anonymous, the Creed of Pope Saint Hormisdas trumps "many sites and blogs by individuals far smarter than us." We can recite the Creed of Pope Saint Hormisdas with confidence. "The first rule of salvation is to keep the norm of the true faith and in no way to deviate from the established doctrine of the Fathers. For it is impossible that the words of our Lord Jesus Christ, who said, "Thou art Peter, and upon this rock I will build my Church," [Matthew 16:18], should not be verified. "And their truth has been proved by the course of history, for in the Apostolic See the Catholic religion has always been kept immaculate." I don't belong to the Charismatic Movement (or Renewal). I favor the Traditional Roman Mass. I don't knock Catholic Charismatics. My understanding of them (I am open to correction) is that they sway, shake, and practice a very emotional form of spirituality. That isn't my style. However, as long as they adhere to that which Holy Mother teaches, then good for them. If they connect best to God via Church-approved, charismatic ways, then I am happy for them. I am certain that Catholic Charismatics are far holier than I. I hope that they will pray for me. I welcome and need their prayers desperately. Peace to my brothers and sisters in the Catholic Charismatic Movement. ~M. Ray said..."Well, Mr. Thomas, you show above that you accept the progressive views of Pope Francis. Quite a few in the Church these days also want to see the teachings of the church change, as you do, regarding marriage and the reception of communion." I don't known that I want things changed. I simply accept that which the Bishop of Rome teaches. I recognize that a Pope's prudential decisions may not prove successful as he desired. I recognize that we have the right as Catholics to make known (respectfully) to the Pope our concerns. Beginning in powerful fashion with Pope Venerable Pius XII, our Popes have implemented many "progressive" reforms and practices within the Church. Pope Venerable Pius XII entered the Church into the Ecumenical Movement, authorized prayer and worship with heretics and schismatics, overturned the Midnight Eucharistic Fast, and enacted radical liturgical reforms. Popes Francis, Benedict XVI, and Saint John Paul II have followed in various ways Pope Venerable Pius XII's "progressive" lead. Are the progressive policies implemented by our Popes heretical? Not according to the sense of the faith held through the Universal Church. That is good enough for me. Again, whether our Popes' progressive policies have benefitted the Church as desired is a different issue. Thank you for your explanation about not being a Charismatic, but that you support Charismatics. You stated that Jesus and the Blessed Virgin Mary want us to be calm and obedient, as if you know exactly what Jesus and the BVM want, which sounds as if you have a direct line of communication with them both, which is arrogant. We have a right to be upset by the Pope when he contradicts and goes against what Our Lord taught. Whether we are respectful or not doesn't change that the Pope is wrong and goes against Our Lord, which obviously doesn't bother you in the least. One of the weaknesses of "True or False Pope" is the unsupported assumption that Jesus meant the indefectibility of the Church when he promised "the gates of Hell will not prevail against it." There is no basis for this interpretation except an early parenthetical opinion by a Pope who was fighting against heresy in his time. The Pope was taking his opinion from Origen, who is not a Saint nor a Doctor and simply was expressing his opinion and getting it wrong. The application of that verse to indefectibility was simply made up out of thin air. Jesus never promised an indefectible hierarchy, which is entirely different from an indefectible Church, which seems to get conflated quite a bit. The authors of that book make arguments from authority only on that particular verse, not from what the text actually says and what was meant when it was spoken. They argue essentially - " Pope such and such mentioned this so its Catholic teaching." They have a very weak argument in that case and fail to address it fully. Otherwise the book is OK. The original meaning of "the gates of Hell will not prevail" was essentially a promise of The Resurrection, eternal life, freedom from the hold of Death. Jesus conquered death which is why Scripture says He "lead a host of captives" out of Hell. He promised his little ones they would not be held by the gates of Hell by which He meant Death itself. The Gospel was apealling to people because they had little hope of Resurrection. All of the earliest commentators support this interpretation which was widely held. Even hymns were composed about the Resurrection. Today the verse is entirely misused to claim indefectibility when it was never meant to support that notion. All of the commenters appealling to that verse have not really researched what it actually means, they simply repeat what they have heard, or what they want it to mean. The Church is not the heirachy, nor is it simply the earthly organization. Anonymous said..."Thank you for your explanation about not being a Charismatic, but that you support Charismatics." I support the rights of Charismatics to embrace Church teachings and directives that pertain to the Charismatic Renewal. Who am I, a nobody, to say otherwise? I wish peace to Charismatic Catholics. Anonymous said..."You stated that Jesus and the Blessed Virgin Mary want us to be calm and obedient, as if you know exactly what Jesus and the BVM want, which sounds as if you have a direct line of communication with them both, which is arrogant." I know what Jesus Christ and the Blessed Virgin Mary desire of Catholics. I have, we have, "a direct line" of communication to them in the form of Holy Catholic Church. Obviously, we can also pray to them directly. Why is it arrogant to note that Jesus Christ said of his bishops, most certainly, His Popes, that he who hears them, hears Him? Do you disagree with Jesus Christ? Why is it arrogant to note that the Blessed Virgin Mary, our spiritual Mother, exhorts us to obey her Son? Why is it arrogant to note that under God's protection, "in the Apostolic See the Catholic religion has always been kept immaculate"? Anonymous said..."We have a right to be upset by the Pope when he contradicts and goes against what Our Lord taught. Whether we are respectful or not doesn't change that the Pope is wrong and goes against Our Lord, which obviously doesn't bother you in the least." We have the right to address respectfully our Church-related concerns to His Holiness Pope Francis. If you believe that Pope Francis has opposed Jesus Christ's teachings, then you are free to make your concerns known to Pope Francis. I don't share with you that concern as I don't believe that Pope Francis has opposed Jesus Christ. I believe the Formula of Pope Saint Hormisdas...the Apostolic See has preserved the True Religion. We can do more than just make our concerns known to Pope Francis, we have a right to make our concerns known on blogs and forums. We have a right to proclaim the truth of what Our Lord Jesus Christ taught, snd that no Pope is allowed to oppose our Lord without faithful Catholics calling him out on it in a public manner. You seem to believe that the pope is God, but he is not. Our Lord Jesus Christ is the head of the Church, and the Pope is his vicar. We have a duty to obey God before we obey men who have shown that they oppose God. We can pray and do penance, and especially pray for Francis, in that he turn away from error and heresy and instead embrace our Lord. The main duty of a Pope is to hand on the Deposit of Faith, undefiled by changes made to what Our Lord Himself taught. Hopefully you will one day understand this. -- I understand that we have the right as Catholics to discuss Catholicism on blogs, forums...anywhere (well, where Christians are able to speak freely). -- I don't understand as to why you believe that I view a Pope as God. -- We disagree about Pope Francis and heresy. I don't find that His Holiness has taught heresy. Canonists, priests, and various Catholic writers have commented upon the Pope's letter, and they have insisted that there is not the hint of heresy involved in the situation in question. He declared yesterday that His Holiness Pope Francis did not embrace heresy in regard to the "Buenos Aires Directive." Dr. Jeff Mirus declared that Pope Francis did not embrace heresy. You believe opposite. So be it. I disagree with you. So be it. That is where we stand. I don't believe for a second that Pope Francis has crossed the line in regard to his having embraced heresy. But our disagreement need not prevent us from treating each other in peaceful fashion. ~M. Ray, thank you for the conversation. "...in the Apostolic See the Catholic religion has always been kept immaculate." — From The Creed of Pope Saint Hormisdas. You cite canonist Edward Peters and Dr. Jeff Mirus as saying that the pope has not taught heresy. We, on the other hand, have nearly 2000 years of Church history on our side, in which the divorced and remarried have never been allowed to receive Holy Communion. In regard to His Holiness Pope Francis, he has 2,000 years of Holy Tradition on his side. Sorry, but he didn't embrace heresy. As Father Sotelo noted on Father Zuhlsdorf's blog, the notion that heresy is involved in the "controversy" at hand is nonsense. "Nothing in Catholic teaching has changed. Those who were previously in valid marriages, and have since remarried without a declaration of nullity, cannot receive Holy Communion. Period. "The Pope is trying to direct clergy in those cases where previous validity of a marriage, and subsequent declaration of nullity, are murky, complicated and confusing to sort out. "These are the cases that even the best, most orthodox seminary professors could never have prepared us for. Everyone: please quit acting, talking, and writing as if every married couple’s history and their cases can be so easily figured out by the rules of canon law. "The Pope’s comment of “discernment” is quite orthodox because it refers, not to dispensing with rules, but trying to understand how they apply. There really are examples when we know not whether there is actual adultery and sin, or the invalid, previous non-marriage case, which was the tribunal says cannot be processed for a declaration of nullity. "Kudos to Fr. Z for trying to explain that the Church has ever toiled in a minefield when we look at love and marriage, and when it was real/valid, and when it wasn’t. Canon law and tribunals do their best, but with some cases, even they are stumped–thus, the need for the internal forum, which is what Francis is dealing with." Unfortunately, what we have is more of the same that has a staple of those opposed to Pope Francis from day one of his Pontificate. Pope Francis said "X"...but "X" has been misrepresented as his having said "H"...H = heresy. Another rush to judgment has taken place in regard to some that Pope Francis said (or had written). Sorry, M-Ray, but as Father Sotelo made clear, you won't find heresy in Pope Francis' latest "controversy" (that isn't his fault). I'll repeat it again: those Catholics who are divorced and remarried may NOT receive Holy Communion. Period. That's Church teaching, which Pope Francis is trying to change. He is opposed to our Lord's clear teaching, which is that any man who divorces wife wife commits adultery. You can look it up in sacred scripture. The Pope is promoting a horrible heresy. The bottom line to all this is that God's Magisterium will determine whether there are limited, strict cases in which Catholics who have divorced and entered into second unions may, after serious discernment with God's holy priests may receive Holy Communion. This is very much a "been there, done that," situation for Holy Mother Church. From the Church's very beginning, contentious discussions, and, unfortunately, even physical fights, have erupted among Catholics in regard to "controversial" issues. Ecumenical Councils, for example, included moments of physical violence. Today, the "battle" lines are forming in regard to the issue at hand. Brothers and sisters disagree with other. With God's help, we can and must remain civil with each other as the discussion gains traction within the Church. The, if you will, bottom, bottom line is that God's is with His Church. The Holy Ghost is with our holy Magisterium. In turn, the Apostolic See will render an orthodox decision. As God's humble children, we will called to accept Rome's decision. We have been there, done that...and Holy Mother Church will embrace and teach the truth in regard to the issue in question. We are filled with confidence as we know that Deo gratias, in the Apostolic See, the Catholic Religion has always been kept immaculate. Sin is either sin, or it isn't. Truth is either truth, or not. If you believe in the timeless teachings of the Church, then you will appreciate truth, and not allow the truth to be compromised with contradiction. As sometimes happens, some of those who want or accept a compromise are themselves living in a irregular situation. Those of us who uphold the truths of the Catholic faith are being asked to accept a compromise (contradiction). We won't do it. Fake trads like Fr. Z can spin it any way they like, but they can't make us accept contradiction. Not gonna happen. This will be my last response to you, since quite enough of the combox has been taken up by this debate. Good on you M Ray! Wish I had written your last comment. Truth in every word. Unlike the spin we are constantly bombarded with from others! so now you're saying is these "holy" men will help remarried coulples discern what again? no doubt you must be joking.